The Wizards have run their “without Nenê” record to 5-2 — a subject well-covered by the Washington Post’s Michael Lee this morning. Lee even broke out “points per 100 possessions,” which was nice to see. My only quibble with the story was that it didn’t mention Washington’s ultra-soft schedule, which may have ended up on the cutting room floor as editors tried to make the story fit into their print edition. Here’s a quick look at the Wizards season — rolling averages of their offensive and defensive ratings (points scored/allowed per 100 possessions), as well as pace (possessions per 48 minutes). That the Wizards have had a nice run without Nenê shouldn’t be much of a surprise. His overall play (see the PPA table below) has been mediocre, and while he’s helped the team on defense, he’s hurt them on offense. And, the Wizards have faced a series of cupcake opponents — four of their last seven have been in full tank mode. Their win against Toronto is the only one that could be considered a surprise. Even using the Nenê on/off numbers from the date he got hurt, the Wizards should have been expected to win at least four. What have the Wizards done differently without their big man? They’ve been WAY more efficient on offense (115.3 points per 100 possessions over the last seven games vs. a season average of 105.7), but worse on defense (a defensive rating of 109.7 vs. 104.9 for the season). The offense was largely expected. 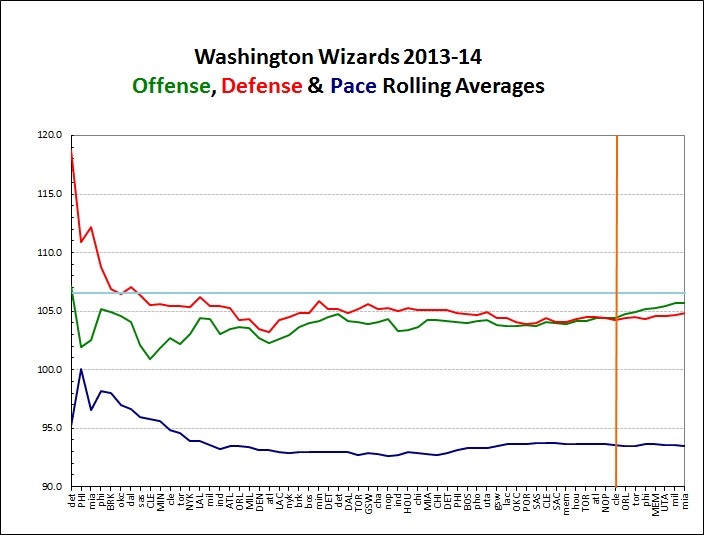 As noted previously, Washington has been more efficient without Nenê this season. The defense is worrisome. They got shredded by Orlando (28th ranked offense), Memphis (about average), and Milwaukee (27th on offense). The Heat also toasted them pretty good, but no shock — Miami boasts one of the league’s top three offensive units. 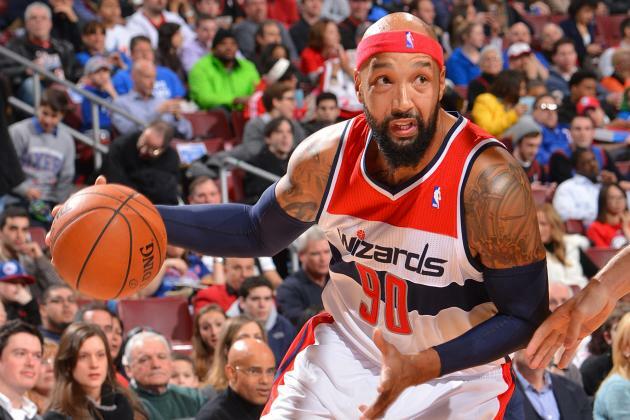 Also helping the Wizards get by without Nenê: the additions of Drew Gooden and Andre Miller. In still-tiny sample sizes for each, they’ve both been exactly what the team needed. Gooden has dominated opposing reserves — at least on the offensive end — and has provided much-needed rebounding and efficient scoring off the bench. Miller has been a steady veteran facilitator who somehow produces despite playing in “epic movie slow-motion” mode. Miller’s production is sustainable — it’s about the same as what he was doing in Denver before he got sent home because of an argument with Nuggets coach Brian Shaw. Gooden’s production will almost certainly moderate, though he’s likely to still be useful the rest of the season. Gooden’s career PPA is 122, and he’s just two seasons removed from a 141. He’s never been this efficient on offense, though. And, his good play to this point is likely to earn him more minutes, which means he’ll end up facing more starters than he’s gone up against so far this season. Worth mentioning: his defense has long been a concern, and so far he grades out as well-below average in the defense part of PPA. To the update. What is PPA? It stands for Player Production Average, which is a metric I developed that credits players for things that contribute to winning and debits them for things that don’t — each in proper proportion. PPA is pace adjusted, accounts for defense and includes a degree of difficulty factor. In PPA, 100 = average, higher is better and 45 = replacement level. PPA is a per minute stat. Trevor Ariza continues to maintain a high level of play. In PPA, he ranks 4th in the league among SFs with at least 500 total minutes; third overall in total production. Marcin Gortat’s production ticked up this week, while John Wall’s went down. I really think it’s time to shelve talk of Wall being a superstar. He’s very good and he has great potential, but there’s still a loooooooong ways to go for him to be considered an elite player. Nice to see Martell Webster’s PPA go up slightly — the first time since December 17th that his PPA hasn’t dropped in one of my updates. With or without Nenê, the week ahead could be a good one for the Wizards. My odds estimator suggests Washington should be favorites to win each of their next four games, although the matchups with Orlando and Sacramento fall into “coin flip” territory. Their odds of actually winning all four are only about 10%, but 3-1 is realistic.